Thin, sensitive gums can recede as a result of overbrushing. This is referred to as gum loss. Receding gums can expose the roots of your teeth and cause the bone decay. Exposed roots can be painful. 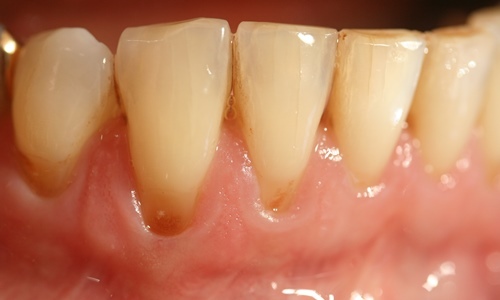 Extreme gingival recession can even result in tooth loss. Performing a minimally-invasive surgery under the microscope, Dr. Zimmer uses a gum graft from the palate to form new, robust gum tissue to prevent further recession. With this, Dr. Zimmer can also cover the exposed roots in many cases. Let us help you regenerate your gums! How does tissue regeneration treat receding gums? The main objective of using tissue regeneration is to create robust gum tissue that is tightly connected to the teeth in order to prevent the gums from receding further. We also cover the exposed roots as much as possible with new gum tissue to give your smile back its natural sparkle. Under favorable conditions we can even partly rebuild diminished papilla height. What does treatment of gum recession involve? We use a minimally invasive “keyhole surgery” under the microscope to relocate your gum tissue to its original position. We then build up the gum tissue with a combination of connective tissue from your palate and a collagen membrane. The combination of connective tissue plus collagen produces new gum tissue that grows tightly onto the tooth. What are the advantages of the “keyhole surgery” under the microscope to regenerate gum tissue compared to traditional methods? The “keyhole surgery” accesses the gums through several small holes measuring 3 millimeters in diametre. This access is much more gentle and heals much more rapidely than traditional surgery which cuts the gums open widely. The combination of grafted connective tissue plus collagen produces new gum tissue that is tightly attached to the tooth and that can withstand chewing and brushing just like normal gum tissue. How does gum tissue normally grow? Gum tissue is tightly attached to the crown of your tooth. The gum attached to the crown is typically callous, thick and, therefore, very robust. It protects the tooth root and bone that it covers. Some of the gum tissue attached to your teeth can be very thin and, therefore, very sensitive. The tissue attached to your teeth may even be missing in some places. When you put too much strain on your gums – typically by overbrushing – you can loose thin gum tissue. We refer to this as gum recession (receding gums). What problems can receding gums cause? 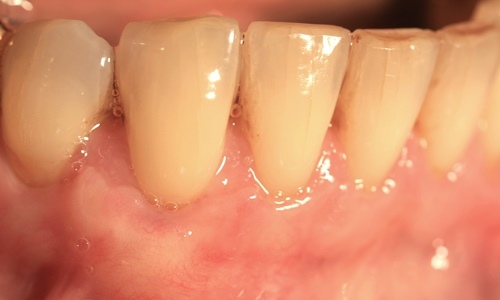 Receding gums often go hand-in-hand with painful exposed roots and isolated cases of bone recession. The condition also carries a high risk of root cavities. In some extreme cases, severe gum recession can result intooth loss. That is why it makes sense to treat pronounced cases of recession with targeted tissue regeneration.